Speaking of tax cuts, I thought everyone should see a nice picture that compares the Obama position with the Republican position. 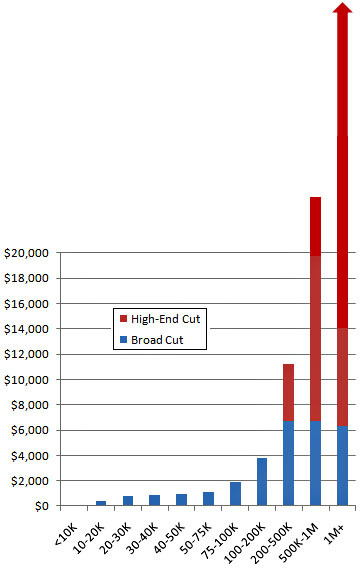 As you can see, under the Obama plan (in blue) everyone gets a tax cut. According to the Joint Committee on Taxation, your average middle class household gets a cut of $916. An upper middle class household gets $3,766. A millionaire household gets $6,349. Money for everyone! But that’s not enough. The red lines roughly show the additional tax cuts under the Republican plan. Everyone making up to $250,000 gets nothing. But the tiny number of households above that threshold get huge pots of money, and the pots get bigger the more money they make. I don’t have enough room on the blog to show it properly, but millionaire households get an extra $100,000 or so over and above what they’d get from Obama’s broad tax cut. That’s what we’re fighting over: a broad tax cut with something for everybody, or a broad tax cut plus an extra bonus for the upper middle class and an extra super duper bonus for the millionaire class. That’s what the Republican Party has unanimously staked its future to.